Dengue is often called breakbone fever, and Mrs Yanki Lama knows exactly why. Last month, she developed a high fever, followed by muscle aches and joint pains worse than anything she had felt before. Off-the-shelf painkillers failed to work. That same day, she visited a doctor who told her she had dengue fever. But the diagnosis puzzled the 37-year-old, who runs an eatery in Kathmandu, Nepal's capital city, which sits 1,400m above sea level. "I thought that dengue was seen only in the lowland areas," Mrs Lama said. "I was quite surprised that I got infected." Ten years ago, she would have been largely correct. But scientists in the Himalayan country are growing increasingly concerned as the mosquito-borne disease makes it way to the cooler highland regions. In 2009, a study published in the Nepal Health Research Council's journal found the dengue-spreading Aedes aegypti mosquito in Kathmandu for the first time. Its authors pinpointed climate change as the major culprit. The first report of dengue fever in Nepal emerged only 14 years ago, when a Japanese tourist came down with the illness after visiting the country. Laboratory tests confirmed that this particular strain of dengue had originated in Nepal. Scattered reports of local cases surfaced in the ensuing years. But in 2010, the country of 29 million people experienced its first major dengue outbreak. It began in August that year, with doctors in the warmer lowland areas noting an "unusual increase" in the number of patients with fever. By the end of October, cases had started to appear at higher altitudes, more than 1,000m above sea level, in areas scientists had previously classified as "dengue-free zones". That year, at least 917 people were confirmed to have dengue through blood tests. Thousands more were suspected to have come down with the disease. Since then, similar large outbreaks have hit Nepal every three years like clockwork. In 2013, there were 642 confirmed cases. In 2016, there were 1,473. In Pokhara, Nepal's second-largest city, which is located at the foot of the Annapurna mountain range, 22 cases of dengue were reported just last month. Currently, about one-quarter of Nepal's land area - mostly in the warmer south - has a suitable climate for the Aedes mosquito... But depending on how greenhouse gas emissions change in the coming years, 80 per cent of the population would be at risk by 2050. These numbers may sound small compared with the size of Nepal's population - or even with Singapore's, where more than 20,000 cases were reported during the 2013 outbreak. But experts there say the numbers are likely to be the tip of the iceberg as many cases go unreported or are not officially confirmed through lab testing. They expect a fourth major outbreak to happen next year. "Dengue has expanded all over the country. Now, it can be found even in the mountainous areas," said Dr Basu Dev Pandey, director of the Sukraraj Tropical and Infectious Disease Hospital in Kathmandu, where the most serious dengue cases are treated. He and other local experts believe dengue numbers will only go up in the coming years, as warmer temperatures provide more hospitable environments for mosquitoes to survive and thrive. In a 2016 report, the country's Population and Environment Ministry highlighted that the average annual temperature there had risen by 0.06 deg C every year between 1975 and 2005. Rainfall has decreased and is expected to continue doing so, while glacial lakes have grown and glaciers have receded. Many people around here have complained of headaches and severe pains... But most thought it was just the seasonal flu and they didn't go to hospital. MR DAMBAN BAHADUR GURUNG, a farmer who had to be hospitalised after coming down with dengue last month. Dr Bipin Kumar Acharya, an associate researcher at the Sun Yat-sen University's School of Public Health in China, has been studying the spread of dengue across Nepal for years. Currently, he estimates that one-quarter of Nepal's land area - mostly in the warmer south - has a suitable climate for the Aedes mosquito. 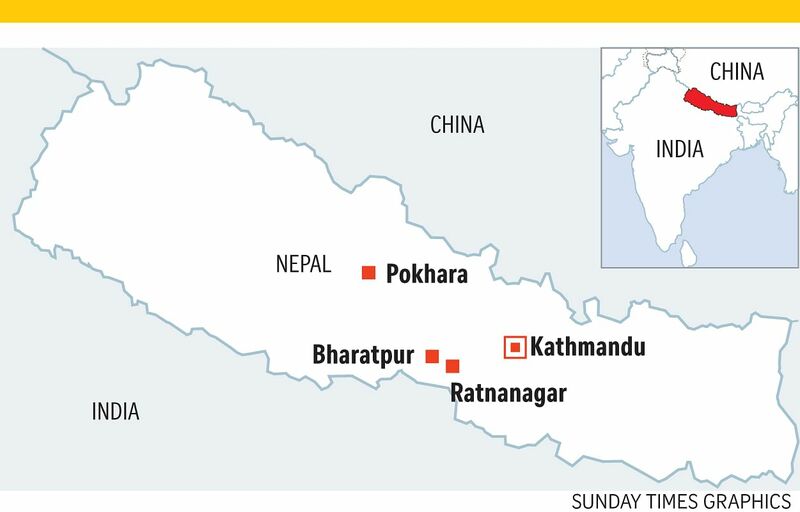 In other words, around 70 per cent of Nepal's population is at risk of dengue. But depending on how greenhouse gas emissions change in the coming years, he predicted that 80 per cent of the population would be at risk by 2050. In the worst-case scenario, said Dr Acharya, who published a paper on the topic earlier this year, more than 90 per cent of Nepalis could be living at risk of dengue fever in 2070. "Due to climate change - and especially the rise in temperatures - areas that are presently unsuitable for climate-sensitive diseases like dengue are expected to be suitable in the future," Dr Acharya said. He added that these projections for Nepal are "fairly large" compared with predictions in a 2008 report, which estimated that 52 per cent of the world's population would be exposed to dengue by 2085 as a result of climate change. People believe that sleeping under mosquito nets can help prevent dengue, but they do not know that the Aedes mosquito bites during the day. DR MEGHNATH DHIMAL, research chief at the Nepal Health Research Council. "This indicates that more resources will be needed to tackle dengue fever in the future, which could be a great challenge to the public health authorities in Nepal," Dr Acharya said. The problem of dengue is not limited to Nepal. Between 2010 and 2015, the number of dengue cases reported to the World Health Organisation (WHO) increased from 2.2 million to 3.2 million. These figures do not take into account the many cases that go unreported or are wrongly diagnosed, as well as those who are infected but show no symptoms at all. One 2013 paper estimated that 390 million dengue infections occur every year, but only 96 million manifest themselves clinically. The disease is also spreading to new areas, with reports of local transmission in France and Croatia emerging for the first time in 2010. In 2014, Japan battled its first outbreak of dengue fever in almost 70 years. Although dengue is not often fatal, it can have serious consequences for those who contract a more severe form of the disease. It is estimated that every year, 500,000 people require hospitalisation due to severe dengue. There is no specific treatment for the disease, and the only existing vaccine - French pharmaceutical giant Sanofi Pasteur's Dengvaxia - has met with controversy after it was found to worsen dengue symptoms in people who had not had dengue before they were vaccinated. Nepal is not the only country that has only recently started to grapple with dengue fever. But unlike in Japan or the United States - where dengue cases began reappearing in 2014 and 2009, respectively, after more than 70 years - Nepal's infrastructure problems make it more vulnerable. Towers of discarded rubber tyres are often stacked in the open along Kathmandu's dusty roads. Other rubbish - including plastic containers and the curved remnants of broken glass bottles - litters the streets and is often not cleared for days. During the monsoon season, which usually occurs from June to September, water collects in these receptacles and turns them into mosquito-breeding grounds. Mosquito larvae could be found in these spots, even when Insight visited earlier this month during the dry season. "The most common breeding habitats you find in Kathmandu or other parts of Nepal are discarded tyres," said Dr Ishan Gautam, an assistant professor of zoology at Tribhuvan University in Kathmandu. "When they are filled with water, mosquitoes find them very favourable and they start to breed." Not everyone in the country has heard of dengue, and not all those infected will see a doctor and get the diagnosis confirmed. In the village of Gairi near Nepal's fourth-largest city of Bharatpur, several people told Insight they had contracted dengue that year. One of them was Mr Damban Bahadur Gurung, a 61-year-old farmer who came down with the disease last month and had to be hospitalised. "Many people around here have complained of headaches and severe pains," he said. "But most thought it was just the seasonal flu and they didn't go to hospital." Dr Meghnath Dhimal, who is research chief at the Nepal Health Research Council, added that many locals do not know enough about the biting patterns of the dengue-spreading Aedes mosquito. "People believe that sleeping under mosquito nets can help prevent dengue, but they do not know that the Aedes mosquito bites during the day," he said. Although researchers are sure that climate change has a role to play in the spread of dengue, it is notoriously difficult to isolate the impact that the phenomenon has on human health. More research needs to be done in this area, Dr Pandey said. "We can find that there is some link between the temperature increasing and the increasing (cases) of dengue," he added. "But I think we can't blame one particular problem - it's a combination of factors." An improved road network, for example, means that people can more easily travel between the hot, wet lowland regions and higher altitudes. But this can also intensify the spread of dengue fever. Experts also spoke of the need to do better disease surveillance in the country in order to accurately ascertain the burden of dengue. It is equally important to raise awareness of the disease. For example, said Dr Gautam, diagnosis is still very poor as dengue testing kits are not yet widely available. "One very important aspect is community mobilisation for vector control, since we don't have an effective vaccine yet," Dr Dhimal said. It is not just dengue but also other mosquito-borne illnesses that worry the doctors. Nepal has an open border with India, meaning that people can move freely between the two countries, and Zika cases there have been on the rise. "There has been an emergence of Zika in neighbouring countries like India and Bangladesh," Dr Dhimal added. "At any time, we might get a Zika case as well."